I don’t usually say it that bluntly but I wanted to get your attention. I need to make a payment on a debt. Usually I start with the term sour stomach. No one likes to hear ulcers because it opens the flood gates of guilt, blame and angst. Not to mention the check book. But that’s about us, can we talk horse? May I explain my thinking? First: Horses were never designed to live at our convenience. They have a prickly digestive system that runs best on grazing 24/7 in nice green pastures. Frankly, they weren’t designed to be ridden either. Big bodies on small feet, and the task of balancing a rider on their back is a big physical challenge to them, one we humans love to underestimate. Horses have another huge weakness. They are all very sensitive. We like to think some horses are more sensitive than others, but each individual horse feels stress and responds differently. Some will shut down while others wear their feelings on their sleeves and over-react, but make no mistake. All horses are sensitive victims of stress and worry. Ironically these same qualities of sensitivity make them capable of immense understanding and partnership- meaning this ‘weakness’ is something we love about them. Counter-balance against all those negatives and a few dozen more too complex or long-winded to list here, this one princely gift: Horses volunteer. It defies common sense, but horses (and dogs) choose to be with us. I’m skeptical that men domesticated them, I think it happened more like this, (read here). When horses lay their precious gift of trust freely, prey to predator, into our hands, we owe it to them to do our very best. For all the ways horses lift us and carry us through life, we owe a debt. For the time it was within his right to buck us off and not look back, but instead he was patient, we owe a debt. And most of all, for the simple joy of being with an animal of such strength, beauty and intellect, we owe a debt. If horses don’t take your breath away every day, then you’re doing it wrong. I think by now we have all heard the ulcer statistics: 93% of horses on the track, 60% of performance horses, over 57% of foals during weaning, the list goes on. The chances are that at some point in most horse’s lives, ulcers were there. With these numbers, why do we resist the possibility instead of embrace the chance to help them? If a horse is struggling with behaviors we don’t like, it should always the first step to rule out health issues, and I am not sure, short of a costly diagnosis, that we can ever rule out ulcers conclusively. Sometimes horses communicate pain but we hear it as bad behavior instead. While we should never condone bad behavior, how else do they have to get our attention when pain persists? In the face of these numbers, as a trainer I would rather err on the side of caution. More than that, since people frequently hire trainers when they run into problems with their horses, I think trainers have a responsibility to be especially knowledgeable about ulcers. The first ‘diagnosis’ might be a suggestion from us. Am I some sort of wing nut who thinks all horses should be returned to ‘nature’? Nope, my Grandfather Horse would be dead in a day. Does this mean that every horse needs a $1000.00 course of prescribed medication? Nope. The goal is to save horses and money with some information that too many of us take for granted. Horse owners do need to educate themselves. I have an EGUS/ulcer primer on my website but it’s just a start. There is so much good information available and it should be required knowledge, just like hoof care or first-aid. Good horsemanship always means putting your horse’s well-being above your personal convenience. Secondly, we need to manage their care as naturally as possible. Free choice hay is a good start. Skipping sweet feed is close behind. If your horse needs some extra help, the market for supplements has quadrupled in the last few years. Many are inexpensive and there are lots of holistic products. Finally, who knows your horse better than you? Horse owners are always looking to improve communication and partnership with their horses. If that is going to happen, we have to listen to them, even when they tell us something we don’t want to hear. I had a young horse who was very food aggressive but instead of listening to him, I trained the behavior out of him. The ulcers got worse, but he was more polite when I fed him. I’m still apologizing. Even the best training cannot heal a medical condition, those are two separate things. 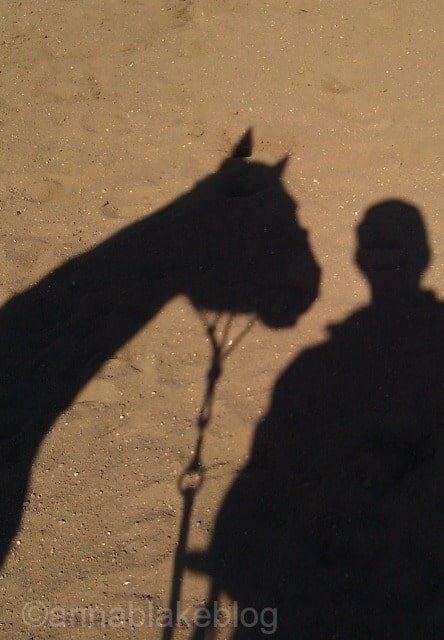 He taught me to listen all horses better, I owe him a huge debt. Do you have a gelding who makes faces or sticks his tongue out? Or a mare who is always pinning her ears? Are they physically anxious or uncomfortable? Or maybe just not the happy, willing horse you remember? Respect your horse: listen closely and don’t let his behavior distract you from his message. You owe him the benefit of the doubt. Yes, Monica, I especially hate that part. I hold on to the hope that articles such as yours, Anna, will cause horse owners and trainers to truly listen and observe what their horses are trying to tell them about pain — pain of any kind but, especially the pain of ulcers. I admit, it’s complicated. Sometimes the ulcers are a superficial response to another chronic pain… but we have to at least be able to talk about it. Thank you. Agree 100%. We need to feed horses the way they were meant to be fed. My OTTB is a worrier. No doubt he came off the track with ulcers. He lives out 24/7, gets free choice grass hay, very low starch concentrate, and soaked alfalfa/timothy cubes (the alfalfa is a good buffering agent for stomach acids). This approach has gone miles toward keeping him comfortable. The good ones usually come with some worry to them. He is lucky to have you.And vice versa. Agree 100%. We need to feed horses the way they were meant to be fed. Freedom is a worrier. No doubt he came off the track with ulcers. He lives out 24/7, gets free choice grass hay, very low starch concentrate, and soaked alfalfa/timothy cubes (the alfalfa is a good buffering agent for stomach acids). This approach has gone miles toward keeping him comfortable. In fact all our horses get unlimited turn out and pretty much as much hay as they will eat. I am very lucky to be in a place where 24/7 turnout is possible. While there certainly are horses that like the comfort of their stall, most seem content braving the elements and having enough space to chill. After our successful EPM treatment, my mare gets regular visits from a chiro/acupuncture vet every month. She’s never been scoped, but he seemed to feel she was predisposed to ulcers and recommended aloe vera juice. It has worked great, she also gets free range hay and as much turn out as possible. I switched to a Smartpak pellet for ulcers with his recommendation since the barn folks kept letting her juice freeze up. He will see her again this weekend, if he doesn’t like her reactions to her ulcer points, we’ll go back to our juice. I had good luck using alternative vet help too. Checking those points is much kinder than scoping. Good luck, things won’t be freezing forever. I am interested in how the smart pak supplements work. I am using aloe vera juice, 1/4 cup twice a day, but I’m in Texas so freezing is rarely an issue! However, Walmart does wonder why I buy all of what they have in stock once a month! I am so grateful I found your ulcer articles, as it really led me right down the pathway of helping my sweet guy, who always takes such good care of me. His performance started decreasing, and he started losing weight (the weight loss was not very gradual, it happened over the course of a month), and when I bought him, I was told he had a hard time keeping weight on him. Then, as I was moving him into a canter one day, he bucked, and it wasn’t his happy-the-weather-is-cooler buck. He meant it. I got off, put him on the lunge line, and couldn’t see a definitive lameness. Called the vet, who also couldn’t get any “real” positive lameness results. Then I called the chiropractor, who promptly said “your horse has ulcers.” So I was a bit incredulous, but after finding your articles, I recognized so many symptoms. Talked to my vet, we started gastrogard, and unfortunately in all of this I had to move him to a new boarding facility (this was one of the contributors to the ulcers I firmly believe). I thought this might make it worse, but it didn’t at all. My horse, after the meds and moving into a much less stressful environment, is really coming around. The weight is slow to come back on, so I am being patient, but I’m feeling pretty positive on getting some control on this after a much better understanding of the issue. Thank you Anna. Sorry about the ulcers, but good job of listening and so great that it’s working out. Usually moving is a stressor, but not if the new barn looks like HOME. Good for you both. Great article – we all need a reminder like this – thanks. I love hearing your horse is doing better, I love reading about him on your blog… and yes, the art is in listening and figuring out the puzzle. Good job, I’m glad he’s back too. Hi Anna, I was an auditor at Linda Wagners yesterday. It was great!! What can we use daily for the prevention/treatment of ulcers? My gelding was treated for ulcers about 4 years ago, bodyworker suspected so I called vet. Is there a daily preventative?? Patty, thanks, glad you enjoyed the clinic. I don’t know that I can squeeze that answer into a comment box, I think I’ll need to write a blog about it. Soon.